Do cats really make everything better? I'm not sure. But they certainly liven up these dress shirts. Thank the talented artist who embroidered them for that! These are the work of embroidery artist Hiroko Kubota. Just look at her neko (cat) shirts! Incredible. "I'm always making clothes for my son, who is rather small, and there aren't off-the-rack clothes that fit him just right," Kubota told Japanese website Pouch. "At his request, I began making neko shirts." Her son would collect photos of cats he found online. 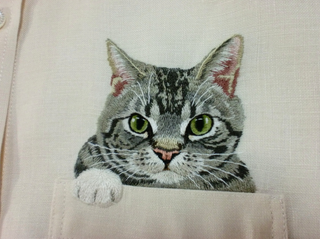 And from those photos, cute cats were picked for embroidered shirts. Kubota has an Etsy shop, which sells the neko shirts. They cost 30,000 yen (US$300) a pop and seem to be selling well—though she probably doesn't charge her son that. That might seem expensive, but really, putting a price on amazing (and time-consuming) embroidery work like this ain't easy. This is cat art! You can see more photos on Kubota's site in the link below or visit her Esty shop.